Well salaam to you, my worthy friends! It’s Dave here again, with a look at a very popular video slot machine called Arabian Nights. 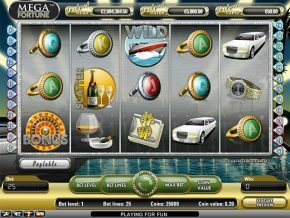 This one has always been a favourite of many people because it’s affordable to play for money because it only has 10 paylines, but still gives you access to some really big progressive jackpots. There’s only one coin value available which is €0.50, so it’s an uncomplicated game – your only choice is how many lines to go for. Even if you’re not lucky enough to ride your magic carpet to the progressive jackpots, there are quite a few combinations in the basic game you can activate to get extra payouts during a free-spin round. There are also wildcards and scatter symbols to shake things up a bit. So, you don’t have to be a GENIE-us to play… Sorry! There’s a nice simple graphical layout with this game, and whilst it’s not as clever with its graphics as some that does make it nice and fast. The reels on this one spin super-quick! Symbols you’ll find in game include arabic slippers, a bedouin tent, bejewelled knives… and a camel, of course. There are some mosaic playing card symbols and special ones to keep an eye out for, and they all combine to add up to some potentially big pots if you’re playing for cash. Appropriately, the wildcard in this game is a turban-sporting arabic merchant… although the way he clutches a ruby with a twinkle in his eye makes me think he might be a jewel thief! If he appears then he can stand for any other symbol and complete winning lines and combos for you. Thanks to his enormous ruby he also double the value of any winnings he helps you to get, so it always good to see him arrive in a spin. There’s a scatter symbol, and it’s another appropriate one for the theme – the genie’s lamp. If 2 or more of these show up then it’s win time. Lucky enough to have 3? Free-spin round awaits, oh master! If you see 5 of those arabic merchants/jewel thieves then you will win the basic game jackpot of 10,000 coins. BUT if you get the 5 appearing when you have placed a maximum allowed bet then you will be in for a progressive pot payout. Next best prize is after you get 4 of him in a row when you’ll win 2,500. There’s a comprehensive paytable in the on-screen help for the game. 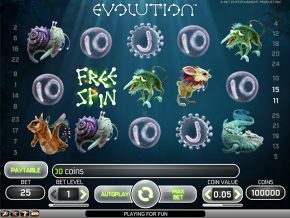 The progressive jackpots on this game can be enormous because it’s played by so many people. Some of them have been absolutely life changing. In 2012 someone won over €8M on an Arabian Nights progressive, and only last year another lucky winner pocketed over €1M. Despite the fact I can remember there were 3 wishes available in the Arabian Nights tales, this game only gives you one bonus play, which is a free-spin round. Find three lucky lamps and you’ll get 15 extra spins, plus any winnings during free spins pay triple – very nice! Unlike other video slots you can trigger these bonus free-spin rounds unlimited times during your play, so if the luck of the genie is with you you can rack up some excellent coin wins. 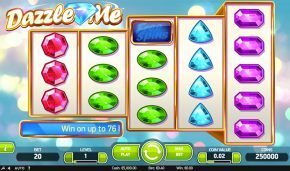 This is a nice and simple game with fixed coin value – your only choice is the number of lines you wish to choose per spin. There’s an automatic spin feature where you can choose how many times the game should play for you. One nice feature is the “skill stop” button – hit this at any time during the spin and it will stop the reels there and then. If you’ve got lucky fingers this could get you some great extra rewards if those bonus symbols are anywhere on the screen. I hope you enjoy your magic carpet ride to the enchanted deserts of Arabia, and if rubbing your lamp isn’t helping you, getting three of them in this game certainly will!